The Winter Olympics are underway and I'm in my glory! I look forward to the Olympic games every two years and get super invested in all of the athletes and events. It sounds cheesy, but one of the reasons why I love the Olympics is because you get to see people achieve their dreams. It just makes me feel inspired!! So far I've loved watching Red Gerard (a baby athlete! ), Adam Rippon (best outfits), and Chloe Kim (Queen of the halfpipe!). Pat and I have been rushing home every night at 8pm to tune into the prime time coverage. LOL. Going to see the Olympics one day is definitely on my bucket list. While this recipe is not Olympic related, I'm also aware that Valentine's Day is approaching. 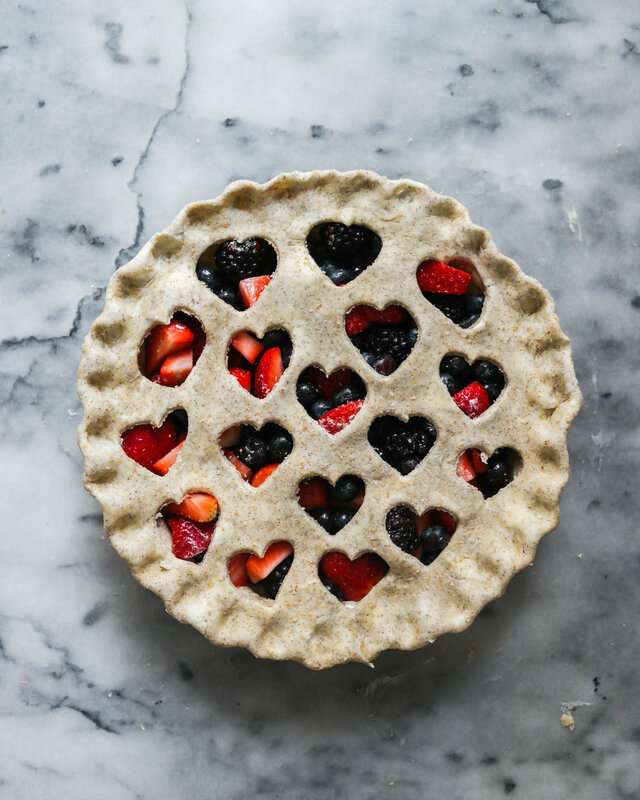 I made this Triple Berry and Rose Valentine's Pie to celebrate and it's so good! Sometimes there's nothing better than a berry pie. And the rose syrup adds a nice subtlety and LOVE (along with the heart cut out crust). If you want something easy to make, fruity, and are craving pie, this is the answer. Happy Valentine's Day! Add the flour, salt and sugar into a large bowl and mix together. Scatter the butter and cream cheese over the top. Using a pastry blender, mix everything together until it starts to come together, then dump the contents out onto a clean work surface and gather it into a ball. Wrap the ball in plastic, press it into a disc, and refrigerate at least 2 hours before using. Pre-heat the oven to 400 degrees F. Split the dough in half and roll the first piece into a circle, adding flour if sticking. Press it into a 9 inch pie pan. Mix together fresh berries in a medium bowl, and add sugar and rose syrup. 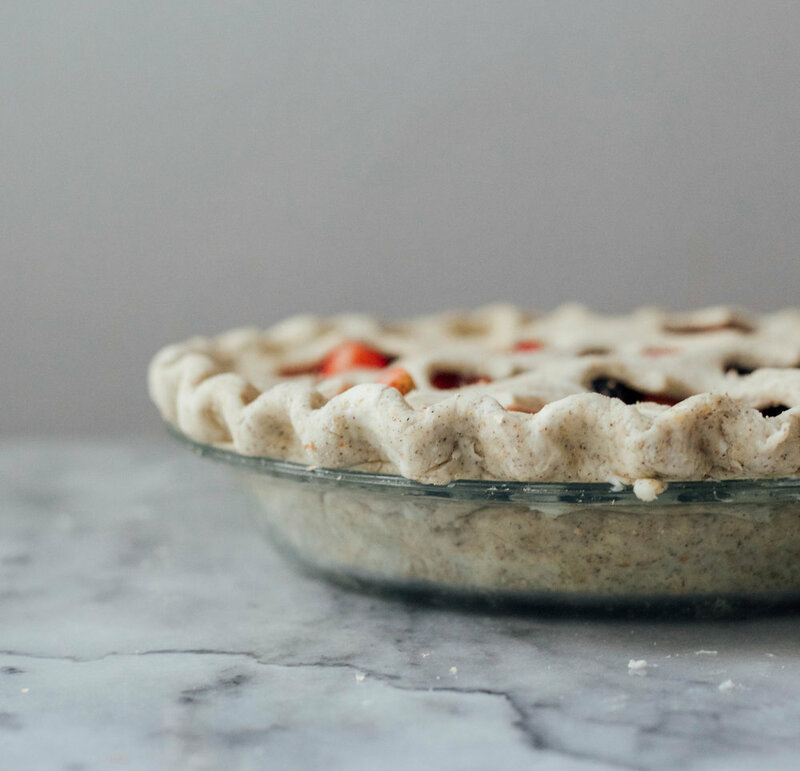 Pour the berries into the pie crust. Roll out the second pie crust into a circle and using a cookie cutter, cut out hearts. Carefully transfer the second crust to the top of the berries and smooth out. Trim and crimp the edges. Bake 35-40 minutes until the crust is golden brown.